Eve started her fitness journey with yoga in 1998 in Austin, TX. After graduating from UVA, she spent several years at a desk job in human resources and wanted to get fit and healthy before starting a family. Practicing hatha yoga through two pregnancies and post-partum, she was hooked. She turned to a serious 5-year vinyasa practice, which ended with a hip injury, a years-long recovery, and a new-found respect for not ignoring your body’s cues. The road to recovery took Eve from physical therapy to massage and chiropractic help, back to physical therapy and prolotherapy and finally to personal training and Clay Fitness in 2009. There she worked with Hyam Hosny, former owner of Clay and trainer extraordinaire. Hyam not only helped strengthen Eve’s hip, but got her started on the path to ever higher levels of fitness, and a passion for fitness and wellness. Whether training for and competing in her first sprint triathlon and first Crossfit competition, or attending multiple fitness retreats in Jamaica, Eve has thrown herself into every fitness pursuit. She has watched herself get stronger, healthier and fitter every year. 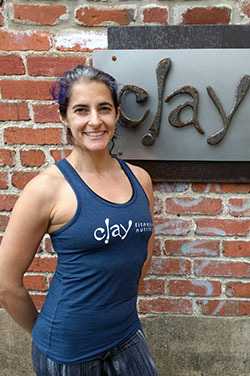 She steps into the role of owner of Clay Fitness inspired to bring this same experience to clients trying to set and reach goals of their own. Eve received her personal training certification (CPT) through NASM (National Academy of Sports Medicine). Callie has been committed to fitness since 1984 and this passion inspired her to retire from her 25 year career in finance. She has immersed herself in the fitness industry and has attended the IDEA Personal Trainer Institute, TRX certification training and is a Certified Personal Trainer through NASM (National Academy of Sports Medicine). Callie conducts baseline and functional assessments, teaches group classes, one-one and small group personal training. Callie grew up in Charlottesville and is a UVA grad. She loves to play both indoors and outdoors and is dedicated to fitness in order to enjoy snow skiing, water skiing, snowshoeing, hiking, cycling, running, racquetball, strength training and yoga. She is committed to helping others achieve their fitness goals and to enjoy an active lifestyle. Jeff Lysiak is a certified Healthy Running Coach and holds a PhD in Human Anatomy and Cell Biology. 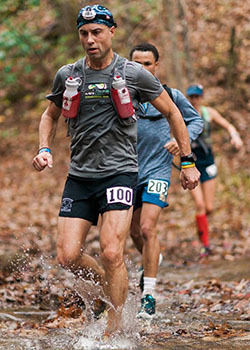 He is an ultramarathon runner and has competed in races from 50K through to 100Mile endurance races. He has been a client at Clay Fitness for more than 2 years and is a certified personal trainer through NASM (the National Academy of Sports Medicine). Jeff teaches the Performance Running classes with the objective of teaching proper running form while incorporating core-building exercises to improve endurance and performance. Jeff is also involved in youth hockey in Charlottesville and is currently Director of Hockey Operations for the Blue Ridge Ice Hockey Association. He and his wife Jennifer and their two sons, Thomas and Henry are active in the outdoors and love to camp, canoe, and snow ski. Susie is a Charlottesville native, however she has an adventurer’s spirit and has lived in various countries abroad. After 8 years of being away she realized her heart was in C-ville, the cherished town she grew up in, with her family. Susie loves all forms of exercise. She has six years of experience and a first degree black-belt in Tae Kwon Do. 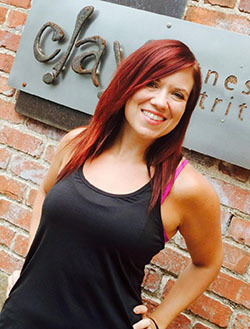 Susie started as a client at Clay Fitness in 2013 and soon after became addicted. Since then her fitness journey has taken her on a quest to learn more about various styles of exercise including CrossFit. In 2015 she won her first Festivus CrossFit competition and continues to train for and participate in competitions. Susie has seen first-hand the effect that fitness and exercise has had in her life. She has a passion to help others grow in mind, body and spirit because she is a firm believer in the effectiveness that fitness has on the person as a whole. She has received the American Counsel on Exercise (ACE) personal training certification and is ecstatic to work with Clay clients to help them throughout their fitness journeys. Jermaine Rush is a native of city of Charlottesville, born and raised. Growing up he always took great interest in physical sports and physical performance. He has played many sports and participated in many training seminars to expand his knowledge of the body and mind and how they can work together to result in better performance in sports. He played football as a running back for Charlottesville High School for 3 years, as well as lacrosse, baseball, and basketball. He also attended a week-long boot camp for the Marines volunteer group in his senior year of high school and greatly enjoyed all of these activities, but life after high school was when he found the perfect activity to test his will, discipline and mental sharpness. This sport demands nothing but your ALL and we call it boxing. It’s the sport every other sport aspires to be. Jermaine has been boxing for almost 2 years with plenty of sparring sessions, working with the youth, and grueling work out routines that put his body on a different level. He is in better shape than he was in high school. He lost 70 pounds in 8 months — from weighing 225 down to 155. This came from his commitment to working out 2 hours a day 5 days a week. This is when he realized that this was what he had been missing his entire life. 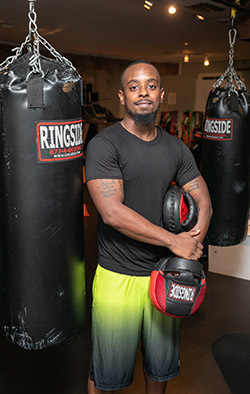 Thanks to his great trainers, Charles Baily, Tyrone Ingram and Norman (a legendary boxer of the Charlottesville area), he learned the different aspects of the art of boxing. There really is a science behind the fundamentals of the sport from the way you breath to the way you bait your opponents in to capitalize on your advantages. Boxing is for everybody on any level you want to take it — if you want to do it to stay in shape, for self defense, or to learn self discipline and beat bad habits. Even if you want to compete! Boxing is not only a way to work out — it also improves your reflexes and your eye-hand coordination and offers a new way of thinking that goes hand and hand with life. Coach Jermaine (aka Coach Jay) encourages anybody from youths to elders to give boxing a try. It could change your life and your way of thinking, as it is a tremendous way to relieve stress, build self esteem, and challenge yourself. Boxing is not just a sport, its a way of life that only asks for commitment, patience, and will. Plus, did we mention that it’s fun? It’s fun!! Sarah Lourie earned her degree in Health and Exercise Science from Furman University, where she played Division I Volleyball and Softball. Since graduating, she has spent most of her career coaching volleyball and softball and teaching Health and Physical Education to students ranging from Kindergarten through High School. After a year at Clay as a client, Sarah was inspired to pursue her Personal Trainer Certification from the American Council on Exercise (ACE). She has also completed her ACE Youth Fitness Specialist certification. 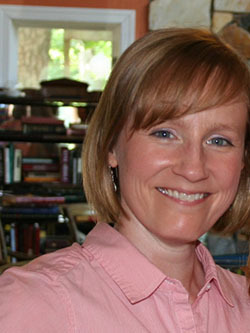 Sarah has lived in Charlottesville for 12 years with her husband and two children. She continues to play volleyball competitively in Charlottesville Recreation’s Women’s and Co-Rec Volleyball Leagues. She also enjoys running, hiking, and both water and snow skiing. Being an athlete has been a part of her identity for as long as she can remember. Feeling strong and fit has been a great source of confidence that has carried over into all aspects of her life. Sarah’s favorite part of teaching and personal training is watching that confidence grow in her students and clients. Helping them to feel that sense of accomplishment – whether from reaching a goal, or acknowledging how far they’ve come, or being able to do something they never thought possible – is extremely gratifying and the reason she loves her job. Amy Floyd, Communications Director/Client Accounts. Amy has been a resident of the Charlottesville area since 1988. After graduating from Albemarle High School, she went on to earn a Bachelor of Science degree in Mathematics with a minor in middle school education from James Madison University. Amy returned to Charlottesville to teach 7th grade math at Henley Middle School. After 5 years, she decided that she needed a change of pace. She currently works at Piedmont Virginia Community College as a test proctor and has the occasional opportunity to see former Henley students. Throughout the last several years, Amy has realized the importance of exercise and healthy eating for herself and for others. In October 2013 at PVCC, she started a monthly fitness challenge to encourage coworkers to make time to exercise. She likes to organize walks, hikes and workouts for her participants. Now, Amy looks forward to encouraging Clay clients as they work to reach their health and fitness goals.